The world is a great and mysterious place to the youngest readers, and a great book can open the doors of imagination and discovery of the world around them. 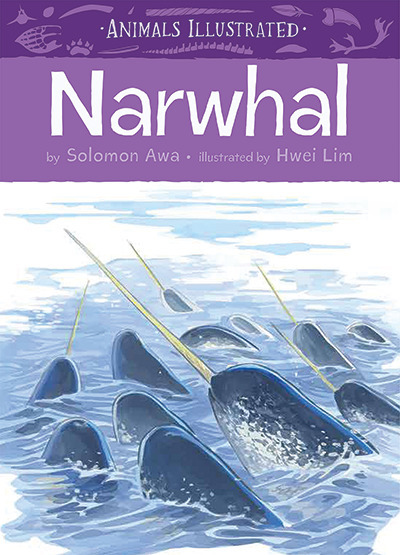 Narwhal by Solomon Awa explores the biology of one of the Arctic Ocean’s most fascinating inhabitants. With short chapters of one hundred words accompanied with beautiful illustrations by Hwei Lim, this book can engage early and emerging readers into the biology of this fantastic underwater beast. Although written for young learners, this book does not patronize its readers with simple vocabulary–readers can immerse themselves in the rich language used throughout the text. This is a book that could inspire young Jacque Cousteaus with an initial introduction to the undersea mysteries of Earth. Classroom Connections: This book is an excellent read aloud resource for any teacher who is looking to jump start their primary science program, or as an addition to the classroom or school library.